Summer is finally on its way and there's no better time to dust down the barbie. Barbeque, bar-b-cue or BBQ – no matter how you spell it, it boils down to the same thing: huge piles of meat and bowls of salad. 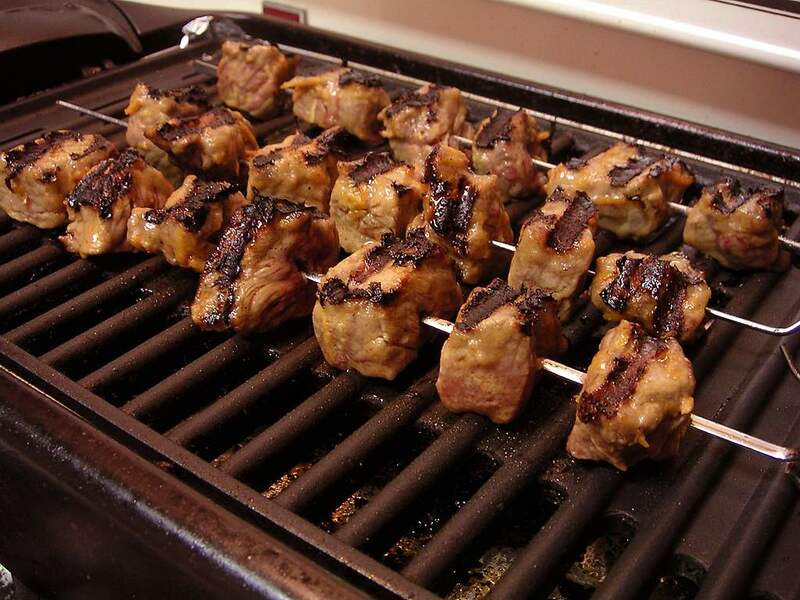 You might think that barbequing is a healthy way to cook and it is - to a certain extent. Cooking meats slowly and a good distance above the flames allows fat to melt and drip away. But, like anything else, there are traps lurking at every corner, waiting to catch out the healthy eater. Having one of everything at this barbeque will provide an incredible 1962 calories and 124g of fat. If you're watching your waistline, that's your calorie requirements met for the whole day – and almost double your recommended fat intake. But there is good news. A spoonful of your average BBQ sauce has 22 cals and less than 4g fat while a serving of tossed salad has only 30 cals and next to no fat. But don't think you're stuck with salad and sauce all day. There are plenty of healthier alternatives that are sure to please your dad and everyone else. In a bowl, combine 450g minced turkey, 3 tbs barbecue sauce, a chopped spring onion, 1 tsp chilli powder, 1 tsp vegetable oil and ½ tsp ground cumin. Shape mixture into four 1/2-inch thick burgers and place these on the bbq. Grill for 4 to 5 minutes on each side or until cooked through. Serve on rolls, layered with lettuce, tomatoes and additional barbecue sauce, if desired. Combine 235ml ketchup, 60ml white vinegar, 110g brown sugar, a tbs chopped onion and 2 tsp lemon juice in a small saucepan. Season with a tsp Worcestershire sauce, black pepper and a pinch each of allspice, celery salt, and mustard powder. Simmer over medium low heat for 5 minutes. Trim off any excess fat from 4 chicken fillets. Wash and finely chop a small bunch of coriander, add the juice of a lime and 2 tbs natural yoghurt. Put the chicken into a large bowl and add the yoghurt mixture. Toss well to coat, cover and leave for two hours or more to marinate in the refrigerator. Cook the chicken over a hot barbecue for 15-20 minutes or until cooked through. Clean and gut a medium-sized fresh trout. Stuff with a sliced fennel bulb and a lime cut into slices. Brush with olive oil and season with salt and pepper on each side. Cook on a hot grill or barbecue for about 7 minutes or until the skin turns crisp and the fish is cooked. Combine a small thinly sliced white cabbage, 2 carrots, peeled and shredded, 1 red pepper, finely chopped, 2 tsp cider vinegar, 1 tsp sugar, 2 tbs chopped mint and 2 tbs Greek yoghurt in a large bowl. Add 1 tsp hot pepper sauce if you prefer. Toss well and serve. Bring a large pot of salted water to a boil and cook 200g dried pasta according to package directions; drain and rinse under cold water. Combine the cooked pasta, a drained and rinsed can of cannellini or mixed beans, 4 chopped tomatoes, a large handful of rocket and a thinly sliced red onion in a large bowl. In a separate bowl, whisk together 100g feta cheese, 100ml tomato juice, 2 tbs balsamic vinegar, 2 tsp olive oil and a pinch of dried oregano. Pour over pasta and toss to combine. In a small saucepan, combine 3 tbs sugar, 3 tbs water and the juice of a lime. Bring to a boil; cook for 5 minutes or until the mixture starts to thicken and become syrupy. Remove from the heat and stir in the zest of a lime; set aside. Peel a fresh pineapple and cut lengthways into 12 wedges. Place the wedges on the bbq and cook for 4 minutes on each side. Brush with lime syrup; grill for a further minute per side or until fruit is well marked and has softened slightly. Remove from heat and brush with any remaining syrup.